Caye Caulker is so laid back our motto is "Go Slow"
Welcome to Caye Caulker, one of the best fishing villages 45 minutes from Belize City by boat or 15 minutes away by air. There is approximately 1800 to 2000 residents who call this beautiful and exquisite island their home. Once on the island the main means of transportation is on a bicycle, golf cart or on barefoot, hence the reason we are known for our "Go Slow" laid-back and relaxing way of life. We boast unspoiled waters on this very little piece of paradise. If you love fishing you have definitely found the place, Caye Caulker my happy home. 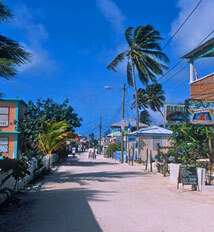 Caye Caulker has gained it's reputation as a permit, tarpon and bonefish paradise. This is one of the greatest places on earth to fish as many saltwater anglers have made it their prime objective to keep coming back for more fishing expeditions.